Personalized royal & white 44” arc gusto vented auto open folding umbrellas comes across as a royal gifting choice for marketers who have high expectations from their single time investments. 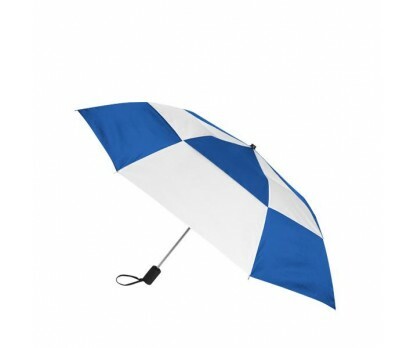 This promotional umbrella can be sought for bulk gifting during promotional events or it can be offered as a sales handout during festive seasons. Features –black rubber coated handle and metal shaft overpowered with double royal & white 44” arc canopy. Auto-open function. Dimension – 44” arc closes to 15”. Imprint area - 6” Top X 4 ½” H X 9 ¼” W.